Driftwood Property is located 5 km/ 3 miles from the lively West Cork town Skibbereen, an ideal base to tour West Cork and Kerry. We are approx. 10 km from the closest point to the sea. Cork airport is approx 80 km and Kerry Airport approx. 125 km. You can visit the stunning nature reserve Lough Ine (Europe's largest saltwater lake) or the coastal villages of Baltimore, Glandore, Schull & Bantry. There is lots to do fishing, walking, swimming or listen to some music in one of the many West Cork Pubs. BREAKFAST available, ask for price. We pride ourselves in offering local produce ( whenever possible), free range eggs, mostly sourced from our own organically chickens. After a day of exploring the area relax in the outdoor HOT TUB. 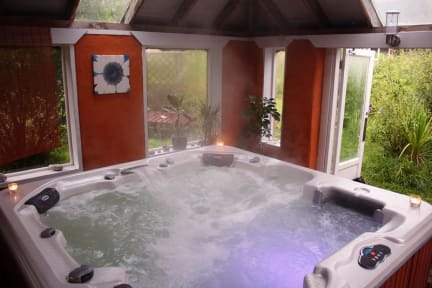 We ask that if you would like to use the hot tub to let us know the day before your arrival, as the heating time for the tub is 12 hours. The HOT TUB is charged at 5.00 euro/person/per 1 hour session. We also have a Barrel Sauna on site, which is charged 5.00/person/per 1 hour session. Cost is priced to cover running costs.